How to fix "Please insert the external storage media and press OK" error in Windows 10? Home »	Fix » How to fix "Please insert the external storage media and press OK" error in Windows 10? Issue: How to fix "Please insert the external storage media and press OK" error in Windows 10? Yesterday I wanted to reinstall Windows 10. I managed to install it, but now I‘ve been getting this weird message – “Please insert the external storage media and press OK”. I added an external storage, but the error message would not disappear. Any ideas how to solve this? The primary cause for “Please insert the external storage media and press OK” error to appear is insufficient amount of free space on the hard disk. Laptop users might encounter this issue more frequently than standalone PC users. However, the error might even occur when you plug in external SD cards or hard disks tool to fill up the necessary amount of free space. 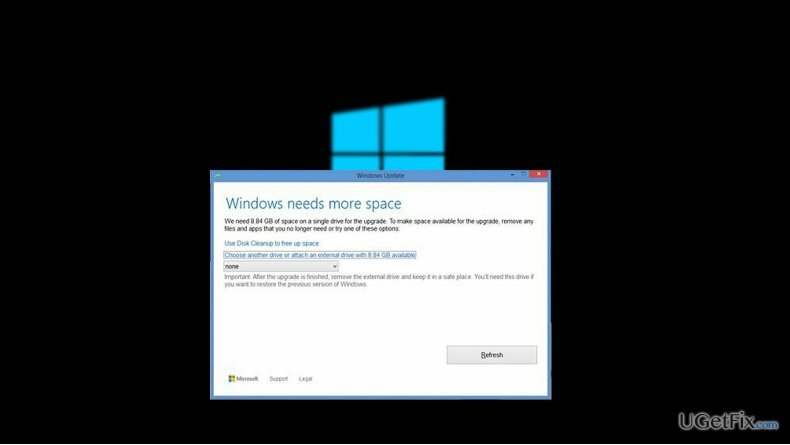 Additionally, you might run into this problem when installing Windows 10 update taking up more space. Furthermore, many users complained of encountering this error message even after adding an SD card or external hard disk. The reason why you see “Please insert the external storage media and press OK” message might be the absence of necessary drivers. In case, you are receiving this notification when you have installed Windows 10, but this issue prevents you from installing bigger updates, you might need to restore the system to the previous version and then reinstall Windows 10 again. Besides the functional .iso file you also need to have the associated drivers for the update to complete successfully. Here are a couple of suggestions to solve the problem. In order to fix “Please insert the external storage media and press OK” error, you might need to revert your system to the previous built in order to reinstall Windows. Press the Power button in the Windows login screen. Now press and hold Shift, then click Restart. Choose Troubleshoot → Advanced Options → Startup Settings and select Restart. Later on, choose Enable Safe Mode with Command Prompt in the list of Startup Settings. When Command Prompt window appears, type cd restore and hit Enter. Now enter rstrui.exe and press Enter again. In the newly emerged window click Next and select your restore point. Now click Yes to initiate system restore. Download Media Creation Tool from the official website. Do not trust any secondary distributors as they might not include all necessary files. The risk to download corrupted .iso file is also relevant. After choosing the specifications of your system, you might opt for USB drive if you do not have enough space on your hardware. Note. When the reinstallation is completed, ensure proper protection of the operating system. For that purpose, Reimage comes in handy. Similar Windows 10 message serve as inspiration for hackers to devise a tech support scam.